Taiwanese manufacturing giant Foxconn announced plans to invest $10bn (£7.6bn) in a new factory in the US. The plant, to be located in Wisconsin, is expected to make LCD panels and employ 3,000 people initially. President Donald Trump, claimed credit for Foxconn’s “incredible investment” which he said would not have happened if he had not been elected. Foxconn has been promised $3bn in subsidies which would come from the state of Wisconsin. 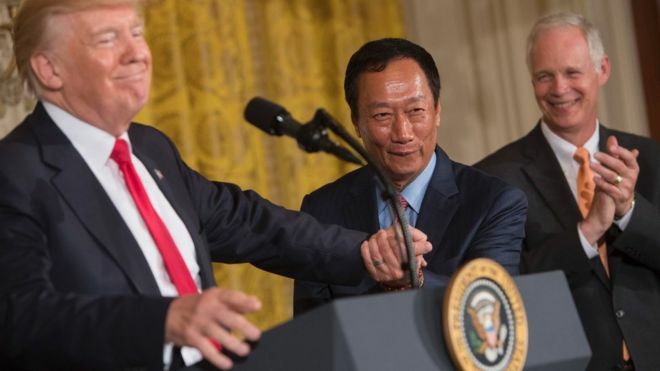 The firm’s chief executive, Terry Gou, made the announcement at the White House in Washington on Wednesday. However he did not give details of when construction would begin or identify where the site would be precisely. President Trump, who met Mr Gou to discuss the subject and suggested Wisconsin as a location, took credit for the investment during a press conference. “To make such an incredible investment, Chairman Gou put his faith and confidence in the future of the American economy,” the President said. During the election campaign Donald Trump focused much of his rhetoric on reviving the US manufacturing sector and “making America great again”. 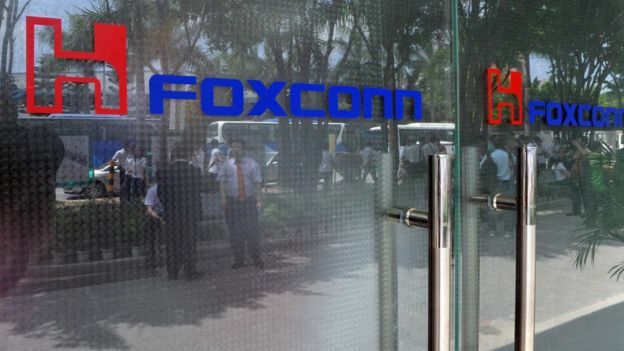 Foxconn is part of Hon Hai Precision Industry, one of the largest electronics manufacturers in the world, with about 1 million employees globally and revenue of more than $100 billion in 2016. The firm has invested heavily in automating its production and works with a variety of companies, including Apple, Tesla and BMW. Foxconn said it employs about 3,000 people in the US currently, including at sites in Indiana and Virginia. But a big investment announced in Pennsylvania has not materialised. The Wisconsin facility, which Foxconn said could be the first of many investments, marks its biggest expansion into the US yet. But some observers questioned the business rationale. “This is clearly a response by Foxconn to pressure from the administration,” said Willy Shih, a professor at the Harvard Business School. Mr Shih said even with the subsidies, the firm faces a challenge since additional supply will keep pressure on prices and many of the other parts required for the screens and factory aren’t made in the US. At the press conference Mr Gou said his goal is to jumpstart a new manufacturing ecosystem in the US. The liquid crystal display panels could be used for televisions, self-driving cars and other products. Foxconn earlier this year said it was exploring possible locations for an investment, sparking fierce competition among different states to win the facility. Wisconsin Governor Scott Walker said his state is preparing a package worth $3bn to secure Foxconn’s commitment. Further details were not immediately available, but the scale of the incentives has raised eyebrows locally. Governor Walker said the promise of the campus, which could one day employ as many as 13,000 people and cover 20 million square feet, was worth it. “This is exciting and transformational,” he said. The plant is planned for south eastern Wisconsin, a part of the state not far from Chicago and Milwaukee. The state, which has historically leaned Democratic, is politically important for President Trump. He won the state by less than 25,000 votes in the 2016 election. Republican Paul Ryan, who leads his party in the House of Representatives, represents the area. Other members of the White House also have ties. The state has seen the number of manufacturing jobs shrink by almost a quarter since 2000, but its economy has remained strong. Wisconsin’s unemployment rate is estimated at 3.1%, lower than the US average. The PM is talking up India as an investment destination. But where’s the money?